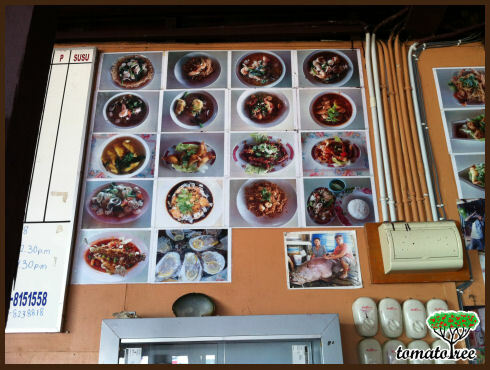 There are 3 or 4 restaurants lies along the Bridge No. 8 at Sim-sim Floating Village, which is the first bridge when approaching the village area. The next bridges are named no.7, no 6, no. 5 and so on. If you can imaging the concept of a floating village, these bridges were build on the sea connects the land with the floating houses and between houses. Most people ended up at the wrong direction because logically numbers start from smaller figure but it simply don't apply at here. Most of the villagers at Bridge no. 8 are Chinese, but I do saw a few Malays/Muslims houses but anyway when you go right down to the end towards Bridge no. 1, there are more and more Muslims villagers. This is Sabah's culture, as I always see Muslims visiting the seafood restaurants running by Chinese, who serve Chinese cooking. Its equivalent to Chinese visiting Malay stall, or Indian eating Nasi Kerabu. Personally I prefer Nasi Goreng Kampung over Nasi Goreng Yong Zhao. No problem. 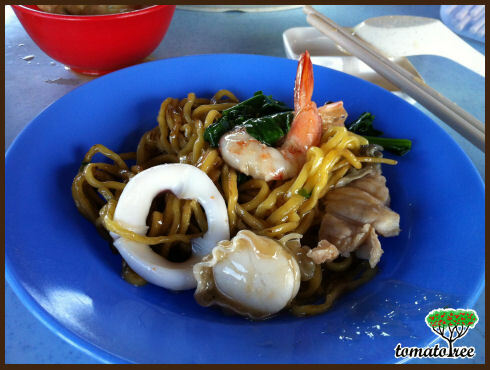 There should be no issue of Halal or not because its seafood. Its (suppose) not an issue here at Sabah but I heard some people is telling my Muslims friends that visiting a pork-free, non-Halal certified food outlets are wrong. I see it as a complain from the local Muslim community, that someone "out there" is trying hard to change their mindset. This message (of not visiting non-Halal certified food) is circulated among the Malay newspaper and TV stations owned by "The Cronies". We need not to discuss further here, but this is discrimination and discrimination promoting hatred and should be stop right away. 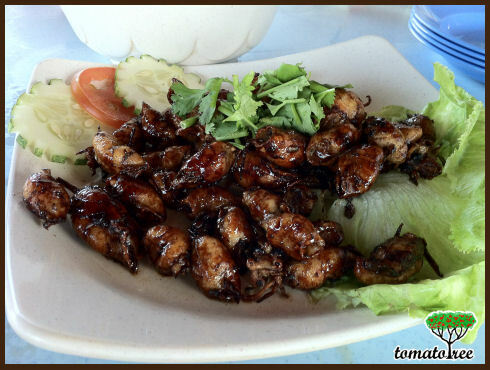 Sotong Masak Kicap (Baby Squid cooked in Dark Soy Sauce), a MUST TRY when you come to Sandakan. I never see this elsewhere! 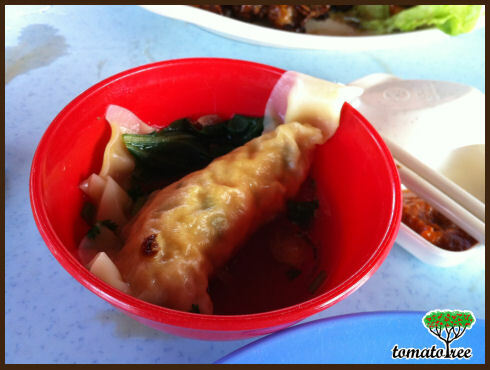 Pi-dan Dumpling cooked in soup is another Sandakan's signature dish! Pi-dan means century egg, a kind of preserved duck's egg that are black in color. Heong-dai-mai (in Cantonese, 香底米)，deep fried thick mee-hun cooked in broth. Can you see the what kind of seafood inside? Its squid, prawn, fish and scallop!!! No frozen seafood here as Sim-sim is a fish market for the locals. 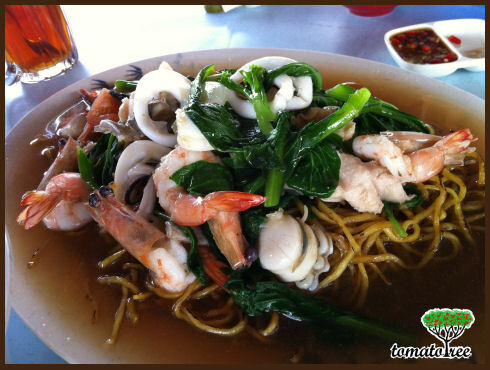 The price is getting more expensive nowadays but trust me, its 100% cheaper than any seafood you can get from KK and KL! By the way, I was visiting the stall on the left at the very end of Bridge no.8. Can't remember the name though, but its all the same! Fresh & Delicious!